In 2015, the adoption of the Paris Agreement was hailed as a historic step for international climate policy, enshrining a global commitment to reduce carbon emissions and limit the average global temperature increase to no more than 2°C. The agreement is built on a flexible bottom-up approach, meaning that countries are free to determine their own climate actions in their Nationally Determined Contributions (NDCs). This novel approach, leading to many different types of climate actions with various levels of ambition, will have manifold trade-related implications. These implications have to be taken into account in order to foster more coherent policy-making, with positive implications for both climate and trade policies, and ultimately for sustainable development and the 2030 Agenda. At the same time, the potential of trade to leverage climate actions is still under-exploited. International trade flows are central for facilitating the achievement of the goals of the Paris Agreement. For example, trade is essential for stimulating the diffusion of environmental goods and services and the relevant technologies as well as for promoting access to them at lower prices, which is currently hampered by trade barriers. Moreover, environmental provisions in trade agreements can foster the decarbonisation of the global economy. In the context of the Paris Agreement, various trade and trade-related policies can significantly support the climate actions spelled out in the NDCs, such as the reduction of trade barriers for environmental goods and services, or the reform of fossil-fuel subsidies. In addition, cooperation on climate measures, which can be supported by the global trade regime, can help to better align national measures and to reduce trade-related concerns. At the same time, the NDC’s varying levels of ambition are likely to increase worries about carbon leakage, which may foster contested trade-related measures, such as carbon-border adjustments. The Paris Agreement thus increases interactions with the trade regime, including different trade agreements. There is therefore an essential need to investigate these interactions in order to foster synergies between climate and trade policies. First, in order to facilitate the mutually supportive interaction between international trade and climate policies, it is essential to assess how the following increasingly important trade agreements can help to contribute to climate mitigation. While there is still tremendous untapped potential, an increasing number of bilateral and regional preferential trade agreements contain climate-related provisions and the EU has emerged as the global frontrunner in that regard. 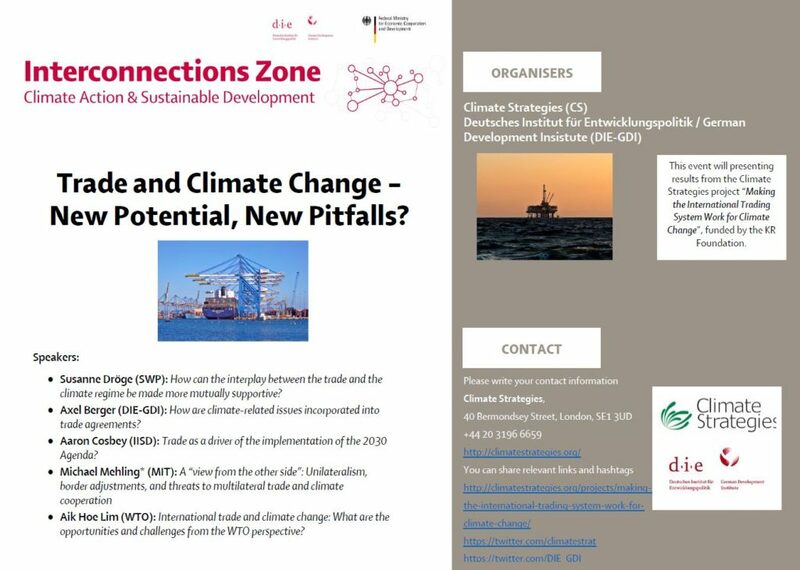 Second, it is also key to investigate the trade-related elements in the context of the Paris Agreement, setting the focus on the NDCs in order to assess the extent to which they support the climate actions and the potential of trade and trade-related policies to promote climate actions in future NDCs. My analysis shows that NDCs do contain a number of trade-related elements but that there is also enormous potential that remains under-exploited: While more than 70 climate contributions include a direct reference to trade or trade measures, only around 22% include trade measures that are specifically geared towards fostering mitigation. A number of steps can be undertaken to harness the potential of the mutual supportiveness of the trade and the climate regime. First of all, there are several options to make sure that future NDCs take more systematic account of trade and trade-related elements. Moreover, there are a number of key issues that are relevant to, or increase the role of, trade rules and their potential to support climate protection in the context of the NDCs. Furthermore, a potential way forward is to increase and improve the institutional interaction between trade and climate regimes in order to contribute to promoting NDC implementation and reducing potential trade concerns and conflicts in that context. In addition, preferential trade agreements can offer potential to foster climate actions. Last, but not least, an additional way forward is to support developing countries to ensure that they benefit from trade opportunities in the context of the NDCs. Overall, both climate-related provisions in trade agreements and trade-related elements in the NDCs offer substantial opportunities for putting a stronger focus on trade-related measures that promote policy coherence. Fostering policy coherence and the mutual supportiveness of the trade and climate regimes would ultimately help achieve the objectives of the Paris Agreement and promote the implementation of the 2030 Agenda and the Sustainable Development Goals (SDGs) it entails.